Date: Apr 23 2019, 8 a.m. - 3 p.m. Looking for a summer job? JBLM CYS is hiring Child & Youth Program Assistants for our 10-week summer programming! Take JBLM youth on field trips, participate in outdoor activities and more. JBLM NAF Human Resources Office is sponsoring a CYS Job Fair! 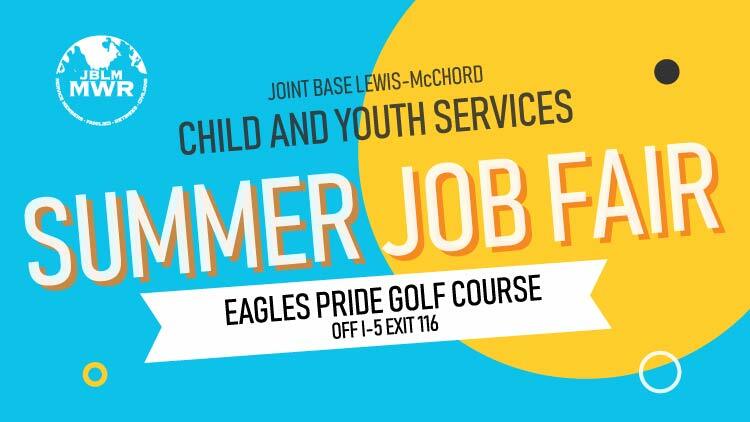 Come to Eagles Pride Golf Course to apply for a position as a Child & Youth Program Assistant (for child development centers, school-age care; before/after-school & camps). Interested applicants should bring their high school diploma/GED certificate, Social Security card, birth certificate or passport and four references (names and phone numbers). Applicants must submit a paper application and a résumé by 10 a.m. at the Recruiting Fair to be considered for an on-site interview. Tentative job offers will also be extended at this hiring event, as well as all background checks. • Able to lift 40 pounds. • Possess a high school diploma. • Able to communicate (verbal & written) in English. • Favorable completion of pre-employment and background checks. • Free on-the-job early childhood education training that can be used for college credit and job advancement. • Free use of fully equipped sports & fitness centers and pools, including free aerobics and fitness classes. • Full access to leisure activities (bowling, golf, American Lake recreation, skate parks, beachside picnic areas, on-base dining, special events and festivals). • Discount tickets to popular attractions across the U.S., movies, sports and more. • Inexpensive recreational rentals for camping, hiking, snow sports, water fun, parties, sports, RV traveling and other outdoor recreation. • Access to guided group trips and other outdoor adventures through the outdoor recreation program. • Full use of self-help auto centers, arts & crafts center, recreation centers, used-car buy-and-sell lots, library programs, parent-and-child play centers and more. • Regular full-time and part-time employees also receive retirement benefits, health benefits, vacation and sick leave.